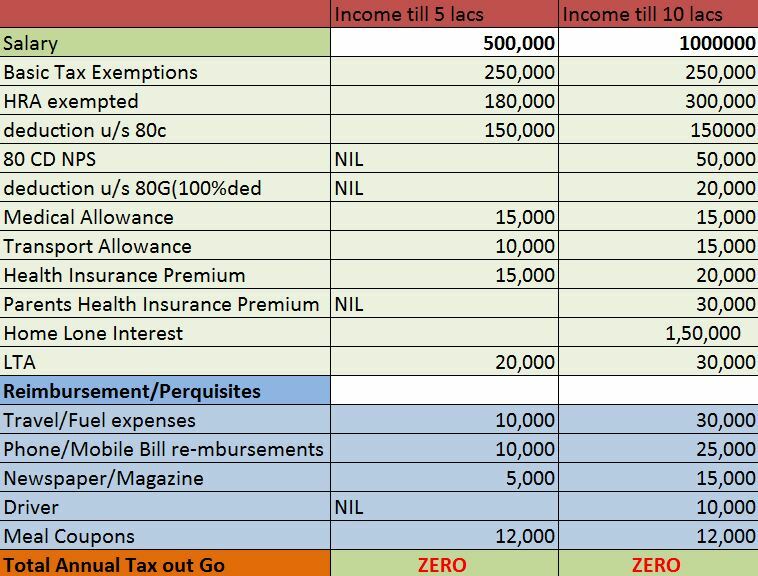 To make your tax zero, we should have our net income equal to or below the exemption limit as defined in the slab rate of the income tax act. 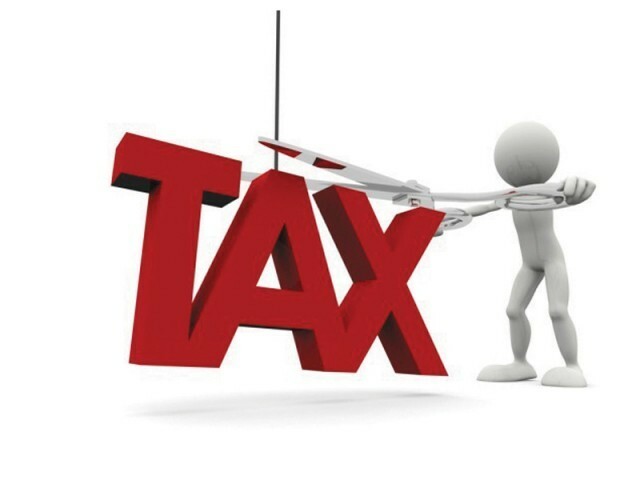 Our Income Tax Act provides us certain deductions, exemption and reimbursement which can be claimed to save the tax at the time of return filling irrespective of class which you fall into whether its salaried individuals, businessman or professionals. These tricks goanna work with you everywhere. To promote the culture of savings and the direct savings of the common man into the rightful resources, the govt allows certain deductions provided the amount is invested in the instruments as listed in the 80C, 80CCC and 80CCD. The aggregate amount of deduction allowed in these 3 sections shall not exceed amounting Rs.1,50,000. You can claim under these deductions by investing under these sections alone or in the combination but the total deduction will be allowed maximum amounting to Rs1,50,000 irrespective of the amount invested in the above discussed sections. 1. The amount should be deposited or paid out of the taxable income. 2. Deduction will be allowed on the basis of actual payment basis. 3. No deduction under section 80C is allowed on investment or expenditure on which deduction is claimed under this section. 4. Any amount withdrawn or pension received from the plan is taxable in the hands of the assesee or nominee in the year of receipt. Buying a medical insurance policy will give you future health security and tax savings. You can claim a deduction upto Rs.15,000 under section 80D for medical insurance premium. An additional deduction of Rs.15,000 can be claimed if you buy health insurance cover for your parents. If the parents are senior citizen, the deduction is even higher at Rs.20,000. This exemption is over and above exemption of your health premium. If you are a landlord then you can claim a standard deduction of 30% on the annual value under section 24. You can also claim deduction for the municipal taxes from the amount received. As it comprises the 2 different portions, the tax benefit is governed by the different sections of the Income Tax Act and these are claimed deductions under the different sections while filling the return of income. The cumulative principal amount of the EMIs paid is eligible for the deduction of up to Rs.1,50,000 under the section 80C. However, the deducted amount will become taxable if the property is transferred within five years of claim. The bigger advantage is the deduction you can avail of the interest component of the EMI. You can claim up to Rs.2,00,000 under section 24(b). The benefit doubles if you have taken a joint loan as both co-borrowers can avail the tax deduction separately. If you have availed of a loan for your education or that of your spouse or children, the interest paid on the amount is eligible for deduction from your income under section 80E. This is in addition to the Rs.1lakh deduction allowed in section 80C. However, you cannot claim the benefit for repayment of principal amount. Under Section 80C, you can claim deduction of up to Rs 1 lakh for the tuition fees paid for two children. This can be availed of by both the parents, though not for the same two children. Only the tuition fees paid for full-time courses of institutions based in India are eligible. Other expenses such as transport fee, development fee, hostel charges, etc, do not qualify and neither do fees paid for coaching classes or to institutions abroad. To promote the concept of charity towards the poor and needy, the Indian government has been regularly encouraging people to donate and this donation can also be claimed as deduction under section 80G. To encourage the people to donate, the government also allows for income tax deduction under section 80G for the amount which has been donated. The amount which has been donated by a person is allowed to be claimed as a deduction under section 80G, at the time of filling of return of income. Donation made are eligible to be claimed as a deduction u/s 80G in all cases except in the case where donation has been made in kind. In order to claim this deduction the donor is also required to furnish a proof of payment. A stamped recipet is issued by the recipient trust in this regard, details of which should be mentioned by the taxpayer while filling his return of income. 4. The registration number of the trust, as given by the income tax department u/s 80G along with its validity. 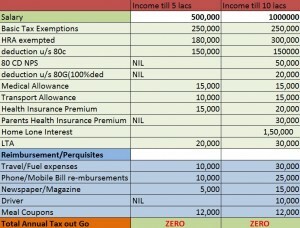 As per the above diagram, donation is divided into two parts where in part “A” deduction for donation u/s 80G without any maximum limit, the income tax provides a specified list of fund where a donee will get 100% or 50% deduction by investing in the same. Where in part “B” the deduction are allowed subject to maximum of 10% of the adjusted gross total income. For e.g. if your income is Rs.9,00,000 then maximum deduction will be allowed is Rs.90000 in case of the 100% deduction of the amount donated and if 50% deduction of the amount donated then Rs.45,000. This deduction can be a great help for saving the tax and promoting the social causes as well. These amendments will take effect from 1st april’2014 and will, accordingly, apply in relation to the assessment year 2014-15 and the subsequent assessment years. For a better understanding, I am going to make the calculations incorporating all the steps to avail the relief from tax. 1. Give your complete details regarding loan and deductions. 2. Fill all the information in the specified area in the form, do not five the repeat information. 3. Check the Form26AS whether the effect of TDS deducted has been reflected there or not. Well, its important to start your tax planning before 31st march, and fill the return by 31st july each year. Save the tax and enjoy your income.